In the Land of Wipuk is a poetic exploratory investigation into the history of the legend of Cathedral Rock and the Sedona, Arizona area. 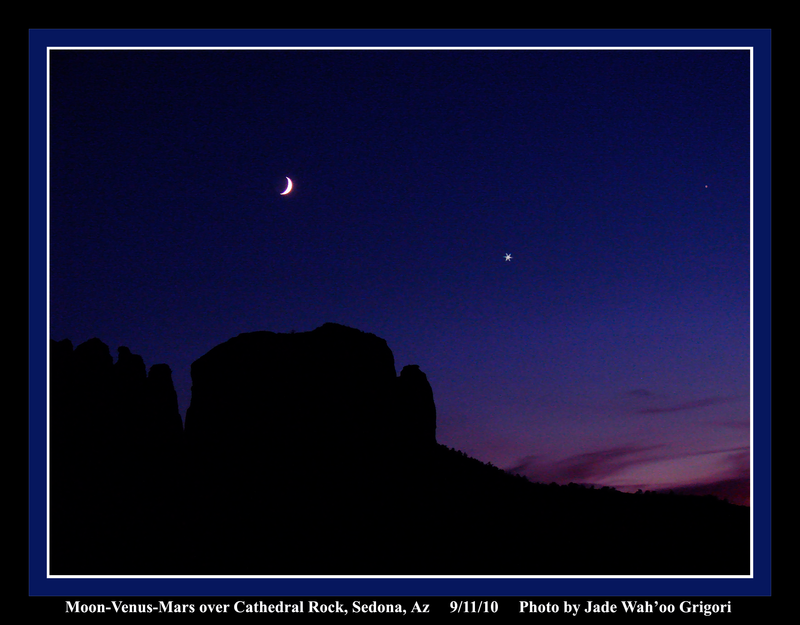 Its basis is a spectacular alignment of the Crescent Moon, Venus and Mars. This configuration is taking place on February 20 and March 22, 2015. For the next few months Mars will then drop lower and lower in the western sky until he passes the Sun and disappears, only to appear in the morning sky for a first reuniting with Venus in the eastern sky on August 31st, 2015. We will be in this Wipuk Mythos cycle, therefore, for the next few months and you – from wherever you may be – may participate in the unfolding of this Mythos simply by being in attention of its astounding presence. May you enjoy and enhance your life experience thereby! There once were a man and woman, husband and wife, who loved each other deeply, and yet they were continuously arguing and bickering. She was displeased with his behavior, as he was resentful of her demanding nature. Their yelling and shouted accusations caused a commotion in the peaceful land. This tumult was enough to awaken Paluluken, the Great Horned/Feathered Serpent, from his slumber. Paluluken lifted his mighty head and spoke to the couple, chastising them for their misbehavior and selfishness. He then directed them to stop fighting and to take the time to look around and enjoy the beauty of the world. This the man and woman did, and found themselves filled with a deep appreciation of the land and of each other. They were able to recognize the others beauty, and so came to be in harmony with the land about them once again. As a reminder of the necessity of respect between Man and Woman, Paluluken turned them into the two towers known as the Lovers’ Rock, embodying the principle of harmonious reunification, eternally. Seen as a Man and a Woman standing back to back, they each hold a view of the world that is different, and in sharing that view, so compliment the view of the other. Each now has a greater perspective of life and the world than if they were to each stand alone, demanding that the other see the world from their own point of view. The myths and creation stories represent, in dramatic form, the dynamic interplay of the sacred dance between the planets, stars, Sun, Moon and Earth. Where there is a particularly impressive event, especially if it is repetitive over the course of time, the retelling of that cosmology, in story form, transmits the cumulative knowledge and guidance that has been derived by its witnesses through the ages. It was during one of these spectcular events that I went to Cathedral Rock and made my commune with Lovers’ Rock, and the attendant phenomenon of the conjunction of the Crescent Moon, Venus and Mars that was going on directly above the rock. Taking a series of photographs, I was able to bring home an excellent image of this sacred dance to which I was fortunate enough to participate. I here share this image with you, so that you can meditate upon it and establish your own commune with this archaic and empowering cosmological event. It is an experience that is just as available to you, today, as it was to the Ancients who transmitted the story, and teachings, of Lovers’ Rock to the many, many generations hence and yet to come.